Enlightenment - ZineWiki - the history and culture of zines, independent media and the small press. Enlightenment is a media science fiction fanzine published by the Doctor Who Information Network. First published in Ontario, Canada in 1984, the magazine released its 150th issue in 2009. As of 2015, they have published their 172nd issue, and it will be an electronic-only fanzine. The more recent issues are available to download free from their website. Editors have included Steve Peers, Colleen Hillerup (1996-1998), Ed Charpentier and Colleen Hillerup (1999 -2000), Graeme Burk (#96 to #156), and Cameron Dixon (#157 onward). Contributors of writing included John Anderson, Amanda Barton, Tom Beck, Alex Boyd, James Bow, Eric Briggs, Graeme Burk, Julie Chaston, Scott Clarke, Karen Davies, Steven Dieter, Cameron Dixon, Michael J. Doran, John Elliot, Matt Grady, Ben Hakala, Colleen Hillerup (Myth Makers), William Hopper, Bryan Jenner, Nin Kolunovsky, David J. Lamb, Derwin Mak, Rod Mammitzsch, Martin Marshall, Peter McAlpine, Greg McElhatton, Mark McMillan, Jason A. Miller, Fiona Moore, Lance Parkin, Susan Paul, Aaron Prokop, Gian-Luca di Rocco, Lloyd Rose, Jim Sangster, Richard Salter, Elizabeth K. Shaw, Dean Shewring (The Gallifrey Gazette, Cosmic Hobo, The Troughton Recorder), Robert Smith?, Deborah Stanish, Jeff Szpirglas, Lisa Truant (Eye Of Harmony), Cheryl Twist, Sean Twist, among others. Illustrations were contributed by Roy Blackthorn, Martin Proctor, and Westley J. Smith, and comics by Michael Leis, and Andrew Specht, among others. Graphic Design is by Cole Greyis, and Heather Murray. Writing from Enlightenment, along with fanzines such as Burnt Toast, TARDIS, The Tides of Time, The Whostorian Quarterly, and others, appear in the fanzine anthologies, Time Unincorporated: The Doctor Who Fanzine Archives, 1, 2, and 3, edited by Graeme Burk and Robert Smith, and published by Mad Norwegian Press in 2010. 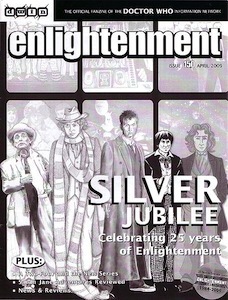 Enlightenment won the FanQ Award for non-fiction Doctor Who fanzine for 1996, 1997, 1998, 1999, 2000, and 2004. This page was last modified on 7 January 2019, at 17:56.